Two Spanish tourists were struck by falling debris in Inverness city centre as Storm Hector swept across the north with a bang yesterday. Emergency services attended the incident on Church Street in the Highland capital around 12:30pm yesterday after debris had fallen above the Munro and Noble solicitors office. Access to traffic was restricted as the Highland Council’s building standards team conducted an investigation and made the building safe. Elsewhere, gusts exceeding 60mph were experienced, with Kirkwall in Orkney clocking gusts of 62mph, as Storm Hector caused chaos to travel arrangements. Ferry and rail services also faced severe disruption as CalMac cancelled the Ardmore – Eriskay, Oban – Castlebay and Mallaig – Lochboisdale routes. Stornoway Coastguard reported two yachts had broken free from their moorings on Skye during a spout of “unusual” weather for this time of year. Skye also experienced the highest volume of downpour with 130ml of rain recorded. Winds continued through Thursday, easing up in the afternoon as the weather moved east, with occasional rain experienced later in the day. 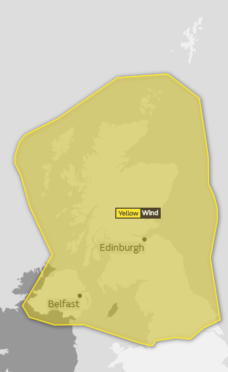 A spokeswoman for the Met Office said Friday was expected to bring potential gales over Shetland with the rest of the north expected to be breezy as the day progresses with dry and sunny spells overshadowing the odd shower. The morning will begin largely dry with some light showers expected in the afternoon. Heavier downpour could be present in the north of Scotland late into Friday. Sunday is expected to be the best day of the week with the Met Office reporting less risk of showers, with the day looking fully dry and a lot brighter.